Greyhound Crossroads - Welcome to the Reading Room! 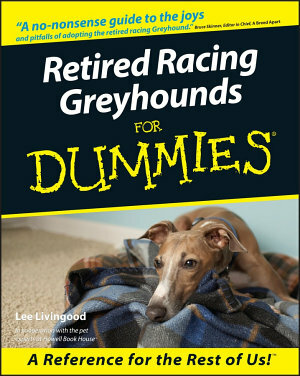 Retired Racing Greyhounds for Dummies (by Lee Livingood) is our top choice of greyhound adoption books although parts of it may be out of date. We would like for all of our new members to read this book before adopting a greyhound! It offers complete coverage of adapting to life with a new greyhound family member. It contains information about adopting, caring for, and living with greyhounds. And perhaps best of all, the book covers all of this information in an easy to understand manner. Greyhound Crossroads offers this book in our Trading Post because we recommend it as the best starter book for new owners! The Reign of the Greyhound By Cynthia Branigan They were one of the first wild animals to come under the protection of humans. They have sat at the feet of the Pharaohs. Their likenesses have graced coins, stamps, seals, and coats of arms. And they have won the hearts of dog lovers worldwide with their sweet nature, intelligence, and grace. Beautifully illustrated with more than 100 black-and-white reproductions and photos, The Reign of the Greyhound is a rich, historical testimony to the breed, celebrating its extraordinary place in canine history and human civilization. Care of the Racing and Retired Greyhound (by Linda Blythe, James Gannon, and A. Marie Craig). This book is offered through the National Greyhound Association on their web site ( http://www.ngagreyhounds.com). It contains 'serious' information about racing greyhounds' health, training, common injuries and treatments. Great information for everyone from greyhound trainers to pet owners! Highly re commended! We bought one for our vet! 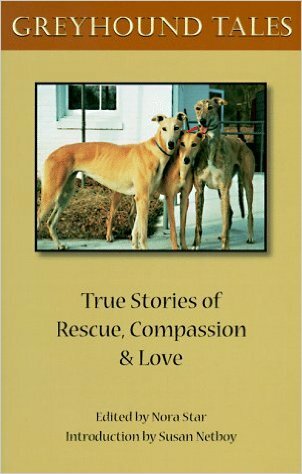 Greyhound Tales is a compilation of stories about greyhound adoption from all over the country. One of the stories in the book is by our director, Kim Owens. In fact, the picture on the cover of Greyhound Tales is of Kim and Robert's three original greyhounds who are the basis of her story and the inspiration for Greyhound Crossroads. (For more information on the history of Greyhound Crossroads visit our History Page.) From left to right the dogs are Stubby, Sunshine, and Angel Owens. When the book was first released, Kim made stampings of their paws with an ink pad and then had rubber stamps made of their paw prints. All three have long-since crossed the Bridge but can still sign books through the stamps. Just ask Kim and she will be happy to sell you a copy of the book, "personally autographed" by Stubby, Sunshine, and Angel, for the cover price of $16. Please note: This book was published years ago when greyhound adoption was new. Greyhound Crossroads does not necessarily endorse the opinions shared in this volume by other authors. A list of books featuring general training and behavior. is very important that any dog knows and understands it's place in the pack order....and this should always be below all humans in the household, including children. This helpful book gives hints on preparing the dog to live respectfully and safely with small children. It provides many solid, helpful hints on bringing a new dog into a family with children. Greyhound Crossroads features this book for sale in our Trading Shop because we believe every family with children should own it! Playtraining Your Dog by Patricia Burnham. This is another non-greyhound specific book that we have found to be very helpful for our members. In fact, although the cover photo is of a Golden Retriever, all of the illustrations in the book are of Greyhounds!! The author knows greyhounds and frequently works with them. Throughout the book she repeatedly shows how very intelligent and trainable greyhounds really are. Plus, she gives great tips on training greyhounds and any other dog! Just as an extra bonus, the pictures in the book of the greyhounds doing agility work are fantastic.